When you charge low rates for your guitar lessons, it makes guitar lessons look like a commodity in your students' eyes. A commodity is a product that functions the same, no matter where you buy it (like milk or Coca Cola or gasoline or a Fender Stratocaster guitar). A low price does attract more students, but they are the wrong kind of students. Students who are attracted by the low price are usually not serious about becoming great guitarists, don't have much money to spend, don't practice consistently and don't stay in lessons for long. A low price repels high-quality guitar students. These are the students who are very motivated to improve their playing, they (usually) have money to invest in guitar lessons and are most committed to do everything you tell them to do to become better guitar players. Teaching cheap guitar lessons makes it easy for other guitar teachers to compete with you (since another teacher can simply charge less than you and take away your price advantage). Instead of charging cheap rates, charge at least slightly more than the going rate in your local area. This helps you become a better guitar teacher, get more high-quality students and help your students become great players. Charging more money motivates you to become the best teacher you can be (to justify the higher rates in your own mind). It also attracts more high-quality students. These are the students who have more money to spend, have specific musical goals and are looking for a teacher who is “the best” vs. who is “cheap”. These types of guitar students take lessons more seriously because of the raised price. This ensures that they practice what you teach and implement everything you have to say to get as much results from their investment as possible. You win and your students win. The next step is to continually improve your guitar teaching skills to offer a lot more value to your guitar students than anyone else and turn them into amazing players. Read these free guitar teaching tips and learn how to become the #1 guitar teacher in your area. 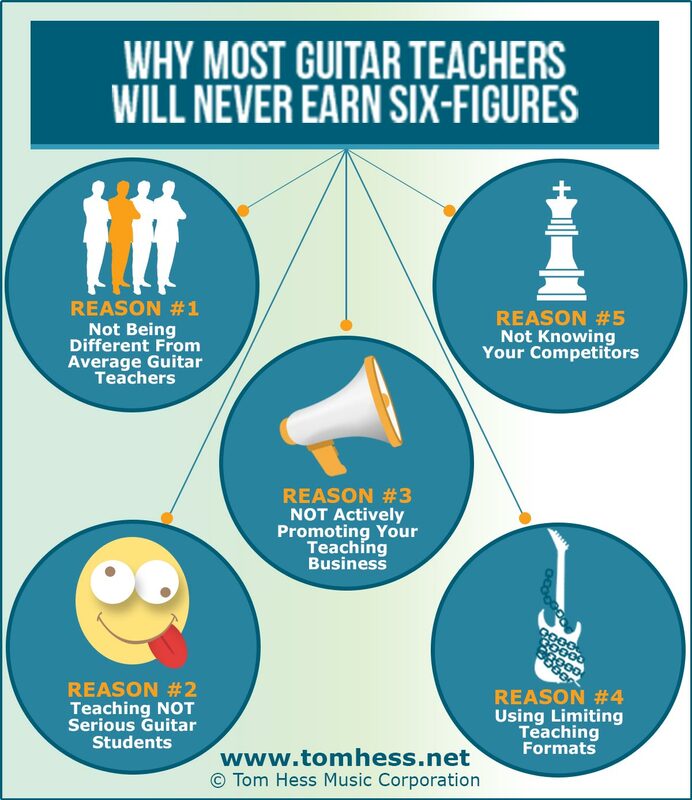 Get started working as a guitar teacher and earn a 6-figure annual income.